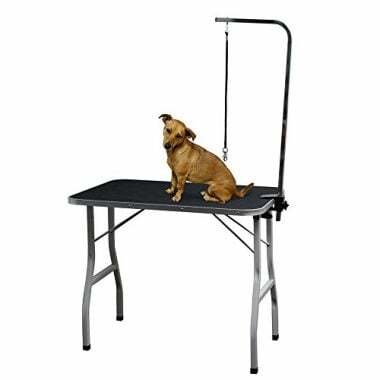 Whether you are a professional groomer, have show dogs, or just like to keep your dog looking their best, a grooming table is a must. It makes the whole process much easier for you, and safer, calmer, and less stressful for your pet. However, with so many grooming tables to choose from, how do you know which one is best for you and your dog? Our panel of pet lovers and dog experts have put together this list of the best dog grooming table reviews to point you in the right direction. 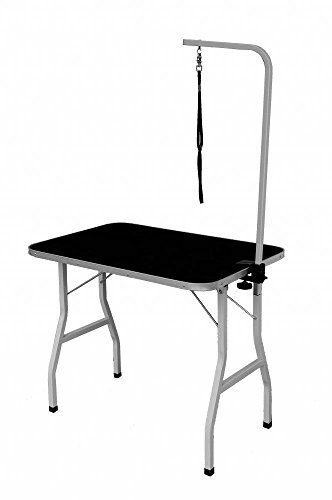 Suitable for at home or professional groomers, the Go Pet Club Grooming Table comes with a grooming arm and leash loop that attaches to the table with an easy to use clamp. The top of the table combines a waterproof top layer with deluxe aluminum alloy edging. Together they prevent absorption and reduce the risk of the wood underneath warping over time. The surface is non-slip, making it safer for your pet, and non-static to make grooming easier and more effective. The whole table is durable and easy to clean and maintain. 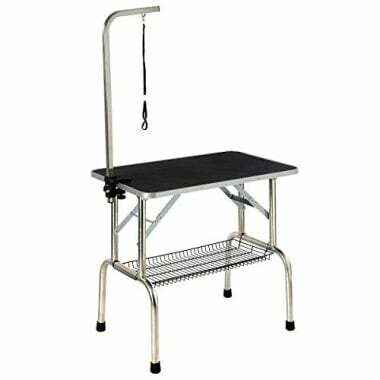 If you are looking for a pet grooming table that fits in a small space, then the Master Equipment Pet Grooming Table is perfect. The round table has a diameter of 18”, making it ideal for small spaces and regular transportation. 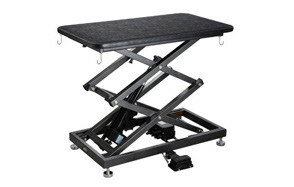 It can be placed on any flat, stable surface to allow you to work at a height that is right for you. The table comes complete with an adjustable grooming arm and loop, ensuring your pet stays safe and secure during grooming. 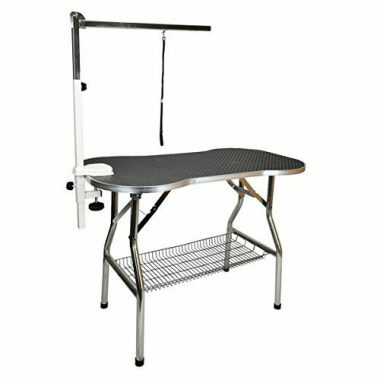 If you are looking for a table that is suitable for larger dogs or continuous use, then the Heavy Duty Stainless Steel Pet Dog Grooming Table by Flying Pig could be just what you are looking for. Designed for professional grooming, the steel frame is durable and sturdy, while the non-slip feet ensure the table does not move during grooming. The table itself is bone shaped and covered with an easy to clean, non-slip rubber mat. The table comes complete with a folding and adjustable grooming arm and leash loop, and under table storage basket. Made from rust-resistant stainless steel the New Large Adjustable Pet Dog Cat Grooming Table from BestPet is durable and stable. It comes complete with an adjustable grooming arm and grooming loop to ensure your pet’s safety during grooming. The table’s surface is made from sturdy ribbed rubber and a static free, water resistant board with skid resistance. Plus, the table is easy to clean and folds for easy moving, storage, and transportation. The thick metal construction of the Paws and Pals Grooming Table for Pet Dog or Cat ensures strength and stability. The table surface is waterproof and is covered with a pebbled non-slip rubber vinyl, which helps to keep your pet safe, comfortable, and calm. Additionally, the table is easy to clean and fully collapsible for easy storage and transportation. The table includes an adjustable grooming arm, loop, and leash clip to keep your pet in one place while they are being groomed. If you already have a grooming table but are looking for the perfect grooming arm, then this arm by Mater Equipment may be the answer. 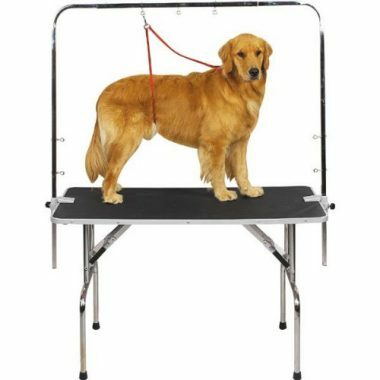 The Zinc-Plated Steel Overhead Pet Grooming Arm is adjustable and features 12 different placement options to meet the individual needs of your pet. Plus, the arm includes two grooming nooses to help secure your pet safe during grooming. If you attend dog shows, then the Giantex Large Portable Pet Dog Cat Grooming Table could be just what you have been looking for. The table folds for easy transport and storage and comes complete with an adjustable grooming arm and grooming loop. In addition, the arm clamps to the side of the table and can be situated in different positions to meet your individual needs. The rubber table surface is easy to clean and non-slip, while the steel frame creates a strong and durable table. If you attend dog shows, then the Giantex Large Portable Pet Dog Cat Grooming Table could be just what you have been looking for. The table folds for easy transport and storage and comes complete with an adjustable grooming arm and grooming loop. Additionally, the arm clamps to the side of the table and can be situated in different positions to meet your individual needs. The rubber table surface is easy to clean and non-slip, while the steel frame creates a strong and durable table. Folding design makes it easy to transport. If you are looking for an easy to use adjustable table, then the Accordion Lift Electric Grooming Table by ComfortGroom meets your need. The foot remote can be slid under the table once it is at the desired height, making it much less likely that you will catch it while grooming your pet. Plus, the table top is made from a high-density waterproof board and easy to clean non-skid textured surface. The edges of the table are protected with vinyl trim, while a thin layer of foam offers added comfort to your pet. In this part of the buying guide we look at some of the factors that determine which is the best table for your particular needs. As well as exploring what makes a good grooming table, we explore some of the key questions relating to why you need a grooming table and why you should consider grooming at home over using a grooming salon. The table you choose needs to be able to withstand constant use, particularly if you have more than one dog, or regularly attend dog shows. It should be made from strong and durable materials, such as stainless steel. One of the many benefits of stainless steel, as well as its strength, is that it is rust resistant, so it copes well in wet or damp environments, including damp dogs. Grooming your dog properly takes time, so it is important that you, as well as your dog, are comfortable. Check the height of the table to ensure that you can stand comfortably without needing to stoop while grooming. If you cannot find one that is at the right height, then consider a tabletop version or an adjustable height table. Grooming your dog can be a messy business. Even if you bathe them before you begin, you still need to account for loose hair and nail clippings, as well as the usually slobber that dogs like to share. The best dog grooming tables are easy to clean and have waterproof tops to ensure the longevity of the table. Grooming your dog is difficult enough without a buildup of static making their hair stand on end or giving you undesirable shocks. The best tables have rubber tops and rubber feet to reduce, if not completely eliminate, static build up. It is important that your dog cannot get off the table or move suddenly while they are being groomed. This is especially important while cutting hair around delicate areas such as their face. Choose a dog grooming table that either comes with an adjustable grooming arm or a dog grooming table which can have one fitted to it easily. Adjustable arms are preferable as they can be set to meet the particular needs of each grooming session. This is ideal if you have more than one pet. Non-slip and textured table tops are also beneficial in ensuring your dog stays put during grooming. Does the dog grooming table have storage space? The last thing you want to do when you have your dog on a grooming table is leave them to collect your tools and equipment. Tables that include storage are beneficial because you can everything to hand and prepared in advance. Storage can vary from mesh baskets under the table to hooks on the side of the table. You want your dog to be comfortable while they are being groomed. The best tables take this into consideration with their construction, often including padded bases. Table size is important here as well. If the table top is too small your dog will not feel comfortable or safe standing on the table. Always check the dimensions of the table top and compare them to the space your dog needs to stand, sit, and lay down comfortably. There are numerous reasons why your dog may be difficult on a grooming table. Nervousness is most likely the main reason, followed by fear of the unknown if they are new to the experience. Being prepared and having everything to hand before you get your dog on the table can go a long way to calming their nerves and encouraging them to behave once they are on the grooming table. Following these tips can help the whole process go much smoother. Introduce your dog to the table before you groom them on it for the first time. Let them walk around it and sniff at it so they know there is nothing to fear. Put your dog on the table and give them lots of praise, get them used to the restraints and the feel of the table. Talk to your dog while you are preparing them for grooming and throughout the grooming process. Have treats to hand to reward positive behavior and offer lots of praise as well as clear direction during the grooming process. While you don’t want to rush the grooming process and risk mistakes or injury, you should work efficiently to minimize the amount of time your dog is on the grooming table. Keeping your hands on your dog the whole way through the grooming process helps give them comfort as well as helping to keep them safe. Combined with your voice commands, gently moving your dog into position helps them to understand what is expected of them, particularly when they are new to the experience. Start young, even if you are not ready to start grooming your dog, introducing them to the grooming table young goes a long way to preventing difficult behaviors and nervousness when the time comes to start grooming. Praise, praise, and more praise is always a positive way to go, even with the most difficult of dogs. Builds a stronger bond between you and your dog. Is an opportunity to train and praise your dog. Is less likely to be frightening for your dog. Gives you an opportunity to check their general health including skin, coat, eyes, ears, nose, teeth, and paws. Adds to your skills set. Ensures results that you are happy with. Means that you can groom at a time that is right for you and your dog, rather than needing to fit into some else’s schedule. A: It is possible to groom your dog without a grooming table; however, it is not advisable. A grooming table is safer for both you and your dog. Grooming on the floor or on a worktop can mean you are bending at awkward angles and putting your back health at risk. It may also make reaching parts of your dog difficult and increase the risk of you slipping with the scissors or trimmers. At best this could mean an uneven coat for a little while, but at worst you could injure your dog or cause them to be nervous about being groomed in the future. Grooming without a table also makes keeping your dog still much more difficult. 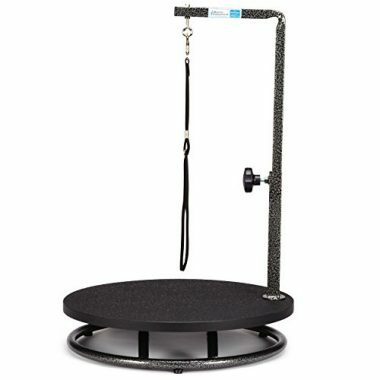 Good grooming tables have safe and effective restraints such as grooming loops and leash attachments. This helps you to position your dog correctly and keep them in that position safely and comfortably. 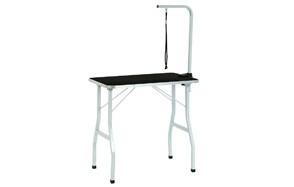 Ease of cleaning should also be a reason to consider a grooming table. You are less likely to have hair traipsed through your home with a grooming table and the surface can be easily wiped down after use. Q: Should I Buy an Electric or Hydraulic Dog Grooming Table? A: One of the difficulties that owners can face with a grooming table is lifting dogs onto and off the table. This is a particular concern with medium and large breed dogs that can be very heavy. You do not want to risk either your own health or that of the dog by lifting more than you can comfortably manage. One answer to this is to invest in an adjustable table. These tables allow you to lower the height of the table, place the dog on the table and secure them safely before raising the table to the desired height. 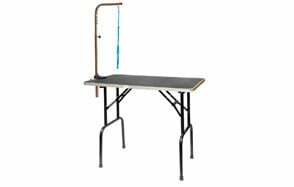 Most good adjustable height grooming tables are wither electric or hydraulic, but which is best for your needs? 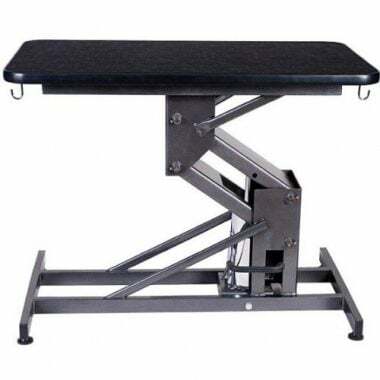 Hydraulic tables tend to be cheaper than electric tables of the same build and safety quality. Height is generally set in increments, so you may not be able to get the exact height that you desire from the table. However, high-quality tables have small movement increments, so you should get very close to your desired height. 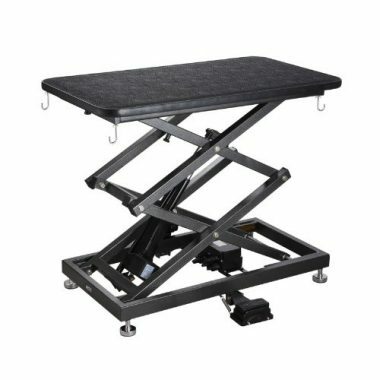 Hydraulic tables are strong and sturdy, and the best have smooth motions and reliable fluid systems. Such tables do require some manual effort to work the hydraulics, usually by a foot peddle. This could be a little tiring with very heavy dogs or if you have multiple dogs in the home. Electric dog grooming tables tend to be more expensive than hydraulic tables of the same quality. They often offer smoother transitions while being lowered or higher and provide greater height control. Electric tables require little or no manual effort on the part of the owner, meaning that they are often the better option for more regular users. However, you do need access to an electric outlet for the table to work, this limits your options in terms of where you groom your four-legged friend. 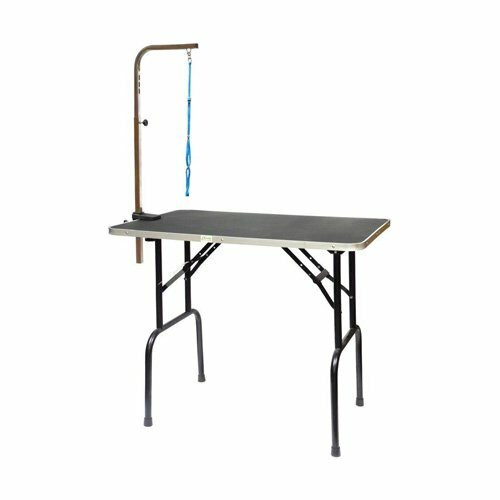 Both hydraulic and electric tables are good options if you buy a high-quality table that meets required safety standards, such as those on our best dog grooming tables list. As with many choices you make for your dog, putting quality first is always the best option. But, by following the tips and ideas in our buying guide you can be sure that you are heading in the right direction to choosing the best table for you and your pet pooch.